A large armored knight points the way to this nostalgic date farm. Time travel back to the 1950s in the store, where you can sample a variety of dates grown here since 1924 and browse the unique retro-themed gift items. At the rear of the building is a cafe but the real stars here are the date shakes. Take a seat at the original soda fountain counter or take a shake to go – you’ll need some sustenance for the rest of the journey. At first glance Bombay Beach looks completely abandoned, a modern-day ghost town and the perfect set for a gory zombie movie. The former waterfront resort has always had a certain allure to those who enjoy urban decay but in more recent years the town has been the home of the Bombay Beach Biennale, which despite the name, occurs yearly. Among the dilapidated homes and abandoned trailers, you will find true artistic treasures. Wander around, take some photos, while soaking in the local creative energy. 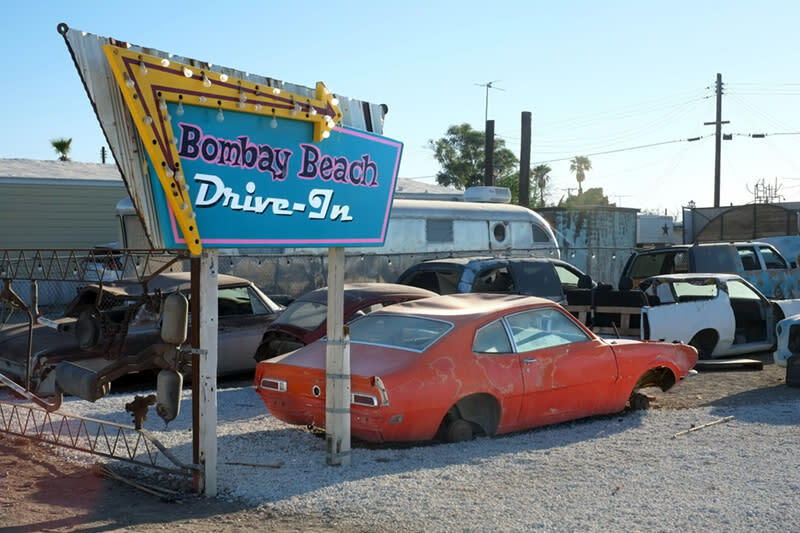 One of the highlights is the Bombay Beach Drive-In on Avenue E. Look for the turquoise sign with the yellow arrow. Next head over to The Bombay Beach Institute of Particle Physics, Metaphysics & International Relations – part museum/gallery, part performance space and home to a new Community Garden – located at 9535 Avenue H. Chickens share this space with various murals, statues and other installations, so take some time to explore all the vignettes. Just down the street on Avenue H and Fourth Street is Angler Grove, created by artist Randy Pulombo. It’s like a trippy, modernistic tribute to the trance-inducing effects of intergalactic disco balls. Bonus points if you can find the Banksy wall! A colorful testament to one man’s passion for sharing his message of love, Salvation Mountain is a giant man-made mound of adobe and hay, layered with what is estimated to be over 100,000 gallons of paint. It’s a vivid mirage in an otherwise dry and barren landscape. 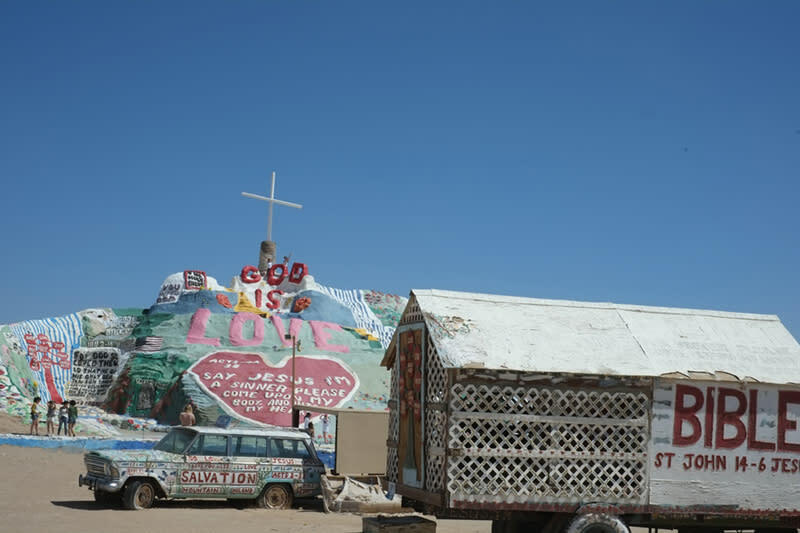 Although there is a clear religious tone to Salvation Mountain many view the site as a valued example of American folk art. Wander freely, take photos and don’t forget to check out the funky art cars. Bonus tip: Slab City. If an off-the-grid bohemian lifestyle is your thing you’ve just found nirvana. Located on former WWII military site, Slab City is a squatter’s paradise best described as an anti-Burning Man, Burning Man-like enclave way off the beaten path. And if you happen to be in Slab City on a Saturday evening during the fall or winter stick around for open mic night at The Range. Trust me, you won’t be sorry. Open 365 days a year from dawn to dusk. Want to see the complete nine-site tour with an interactive map? Visit artpatronmagazine.com.